Meeting new people can be stressful. Whether it is a new school year or a new job, we always want to start off with confidence and make a good first impression. For acne sufferers, meeting new people and can be an extremely difficult process. Fortunately, there is no need to suffer. A complete acne treatment like Obagi CLENZIderm M.D. can help treat acne where it starts. 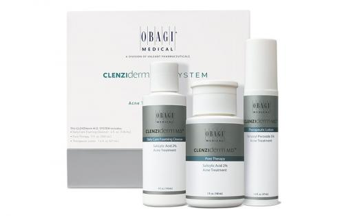 Obagi’s 3-step CLENZIderm system includes foaming cleanser, pore therapy, and therapeutic lotion. Each deep penetrating step reaches bacteria in the pores to reduce breakouts and prevent future breakouts. Step 1: The light, foaming acne cleanser with 2% salicylic acid effectively unclogs pores and washes away dead skin cells, leaving skin feeling clean and refreshed. It also includes calming menthol to help cool irritated skin. Step 2: The pore therapy unclogs pores and clears away dead skin cells with 2% salicylic acid. While leaving a refreshed feel to the skin, Pore Therapy prepares the skin for the next step in the acne treatment regimen. Step 3: The lightweight acne treatment lotion with 5% benzoyl peroxide is uniquely formulated to help clear acne. Two key ingredients, benzoyl peroxide and salicylic acid, are what make the CLENZIderm system different than other treatments. 5% benzoyl peroxide gets deep into the follicles to reach the acne causing bacteria, while the salicylic acid promotes cell turnover to open clogged pores and minimize redness and swelling. This highly effective combination acts quickly, reducing breakouts in as early as one week and continuing to reduce acne through twelve weeks of use. With a quick and continuous acne treatment solution like Obagi CLENZIderm, there is no reason why you shouldn’t be showing your best you. Call Dr. Shapiro’s Skin Klinic (480) 451-1700 to take control of your acne and get back the confidence you desire to make a great lasting impression.